Dr. Andrew Neuman enjoys serving the greater Wichita community, which is new to this native Wisconsinite. His focus on clear communication enables patients to understand their oral health and the steps they can take to improve or maintain their situation. Dr. Neuman is our resident implant dentist. His passion is giving patients options that restore their smile and confidence! 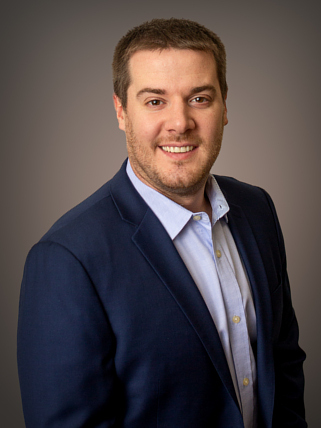 Dr. Neuman has completed postgraduate courses in dental implant placement and restoration, endodontics (root canals), oral surgery, and cosmetic dentistry. In addition to attending conferences, lectures, and seminars, he reads a number of dental journals, to keep current on new techniques and procedures and solidify his foundational knowledge. Dr. Neuman grew up in Pardeeville, Wisconsin, a rural community north of Madison. After living in Phoenix and Houston during his dental school training and residency, he moved to Wichita and loves exploring all the area has to offer! When he’s not working, Dr. Neuman enjoys the outdoors, especially camping, kayaking, hiking, and fishing and hunting. He loves spending time with his family and friends and cheering on the Wisconsin Badgers and Green Bay Packers. He even named his dog Jordy, after the Green Bay Packers’ wide receiver, Jordy Nelson!